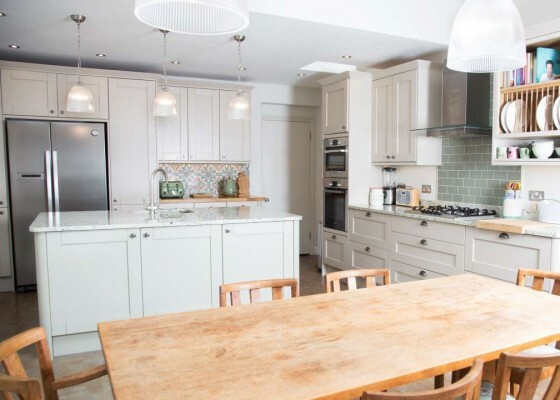 At A&R Design we undertake all aspects of kitchen design and installation using our hand-picked team of specialists, including plumbers, electricians, tilers and carpenters. A kitchen is one of the most important rooms in your home – and for most people it needs to perform a variety of different functions – not just food preparation and laundry, but also eating, entertaining and relaxing. You may want to create an open-plan space and /or incorporate a dining area or other living area. Since your kitchen is one of the more expensive rooms in your home to refurbish, it is important to ensure that you get this room just right, so that you will be happy with it for a long time to come. Once we have understood your vision, we will design your kitchen, making the best use of the space available, whether large or small, and using a range of beautiful materials. Since we are not tied to a specific supplier, we are able to source different aspects of your kitchen individually to give you the best possible range of choice. The style of your kitchen is a very personal choice, and we will draw on our extensive experience to help you achieve your personal dream kitchen, whether you are looking for a traditional, or classic or contemporary style. We will discuss the options with you and provide a range of different samples to help you think about all the different supply styles, colours, materials and quality available for the different aspects of your kitchen. We can source quality products such as bespoke glass or tiled splash backs, door finishes and designs, flooring made of a wide range of materials from slate or tiles to wood, cabinet doors from high-gloss to solid wood, and worktops made of granite, marble or quartz. We can help you to find the right appliances in terms of both function and style – whether you want built in appliances for a sleek look, or whether you want to make a feature of specific items. We will project-manage the whole installation from design to completion, from sourcing and fitting the cabinets and appliances, and installing Electrical works, Lighting and Plumbing, down to the finishing touches like window treatments. We know that many people will have concerns about the disruption that a kitchen installation can cause to family life, and we will do everything we can to minimise this disruption, including, where appropriate, the creation of temporary kitchen facilities whilst the work is ongoing. © 2015 A&R Design & Decorate Ltd.